The BA7500 represents Boston Acoustics� flagship multimedia speaker system, delivering a complete audio package including 4-channel gaming, Dolby Digital 5.1 audio, and stereo music compatibility. Boston Acoustics has put effort into and managed to produce a great aesthetically pleasing system. Their design looks great and will easily catch any eye. 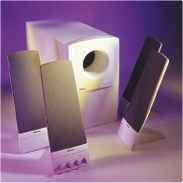 The system consists of 4 SST (Slimline Speaker Technology � thin, tall and flat) satellites and an amplified 6 ½� subwoofer. The package also includes 2x rear tower stands, an external transformer with power cord, all necessary cables, a control pod, and an RCA-Phono adaptor. The setup is fairly straightforward, and includes both labels and color-coding on the back of the subwoofer and plugs. Some assembly is required for the speaker pod/stands. The speakers can be either wall mounted, stand mounted, or tower stand mounted (for the rear speakers). A manual is also included with the system with instructions on assembly and setup for various input options. For 2.1 output: The system will require one analog output for 2.1 sound (the rear speakers will not be used, but a virtualized Dolby Surround effect can be created). For 4.1 Output: 2 stereo line outs for 4 speaker audio or 4-channel gaming or such as EAX and A3D. For 5.1 (Virtualised center channel) Output: Digital audio for Dolby Digital 5.1 is featured with the use of an RCA/Phono digital out on either your systems sound card or hardware DVD MPEG2 decoder. The speaker system will automatically detect the connection type and adjust its output accordingly. The power LED flashes momentarily when switching between modes, for example if you start playing a DVD movie or switch to 2 speaker mode by turning the surround volume all the way down. The only indication I could see of what mode it was operating in was that the LED was somewhat brighter when outputting 5.1 digital audio, as opposed to 2 or 4 channel stereo. The control pod can be attached to any of the satellites, and is connected to the subwoofer by a DIN connector. It features controls for the master volume, surround volume, surround balance, and subwoofer volume. What it lacks however, is a headphone or auxiliary input jack, something that a system in this price range should have included. A remote control would have been a welcome addition, but in the case of a desktop setup it is more of a novelty than a necessity.